So as mentioned last week, I flew over to the West Coast after travelling around the East Coast to conclude my trip to the States. One of the cities I have been dying to check out is San Francisco. I have heard so, so, sooooo many great things about that city and I honestly could not wait to check it myself. First stop was the Golden Gate Bridge and of course, the entire Bay Area was covered by the famous fog. 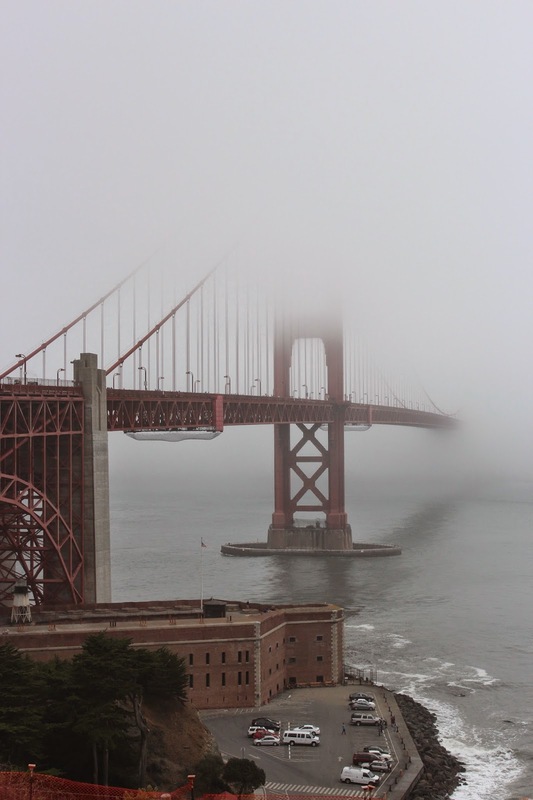 Personally, I didn't mind the fog as I think it is one of those things that makes San Fran so famous. In my opinion, i think the fog makes the bridge even more stunning. If I could pick up my things and relocate, San Fran would definitely be one of the cities I would live in. One of my favourite moments out of the entire trip was actually just leaning over the fence in silence whilst watching the fog dance around the bridge as time swept by. Absolutely blissful. So approximately this time last year, I took about a month off to visit the States located on the other side of the world. I started off in the East Coast and eventually made my way to the West Coast before heading home. First stop in the west coast was a small little Danish town in CA, Solvang, that was filled so many sugary treats. 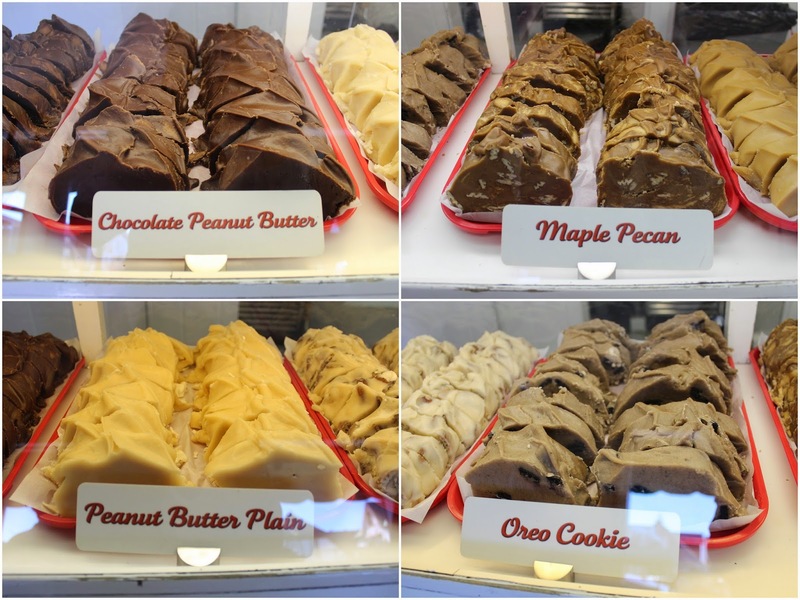 Slightly touristy but an absolute heaven for those with a sweet tooth. Herrroo peeps! So last week, I mentioned that I was giving away two hampers filled with Woolworths Gold products including a $100 Woolworths voucher - one hamper per post. For part 2 of the giveaway, I decided to make one of my favourite super easy winter desserts, yes apple crumble but with a slight twist. Eeekk I am super excited that I can finally share with you guys the news of an exciting giveaway. With thanks to Woolworths, I got to check out the Woolworths Gold range of products plus go on a shopping spree at Woolies for a $100 gift voucher. I felt like a kid entering into Toys R Us with the luxury of a shopping spree. The hamper wrapped in a golden bow tie included a wide range of the "Gold" products including a bar of Jarrah honey, eliche giganti pasta, Italian Extra Virgin olive oil, orange and macadamia cluster muesli, free range chicken stock, milk chocolate caramel ganache, orange almond dark chocolate, cherry tomato and chilli relish, summer berries and elderflower jam and dark chocolate dessert sauce. You can also find the entire line of products here. For those that follow me on Instagram, you may have seen a few snapshots of my creations where I used some things from the hamper plus a few other things which I got at my Woolies shopping spree. When I was browsing through their line of "Gold" products, I saw the words "wagyu beef burgers" and instantly though, omg, sliders / mini burgers / mini sandwiches. Unfortunately I wasn't able to find any slider buns in the local area but I did manage to find a replacement by using one of my favourite types of bread, turkish bread. It obviously isn't the same thing but I love the crunchiness of turkish bread and thought it would give my little babies some extra texture. 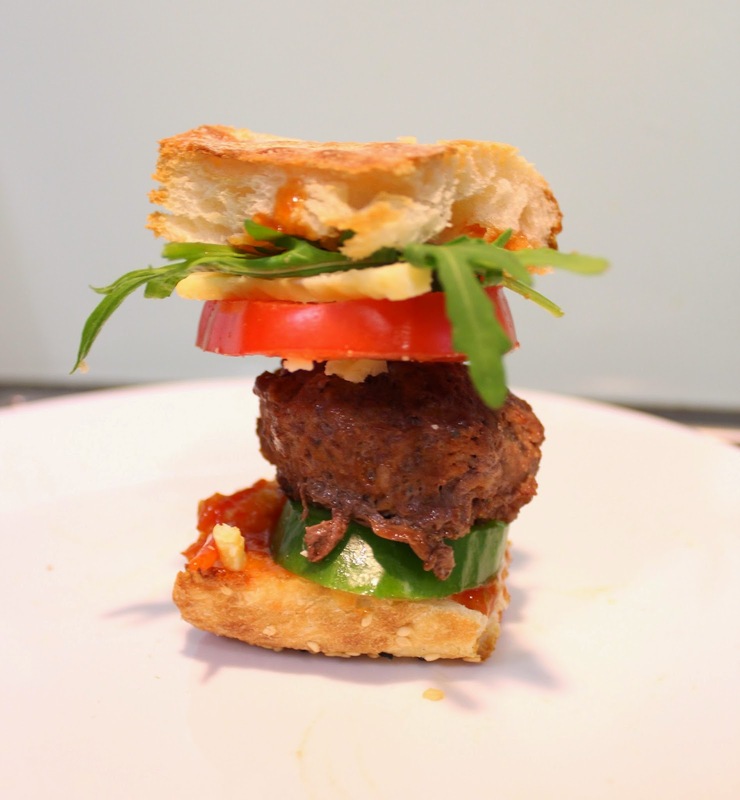 To make these little babies, I basically got two packets of the Gold wagyu beef burger patties, some Gold west country farmhouse cheddar cheese, tomatoes, cucumber, rocket, turkish bread as well as the cherry tomato and chilli relish and olive oil from the hamper. 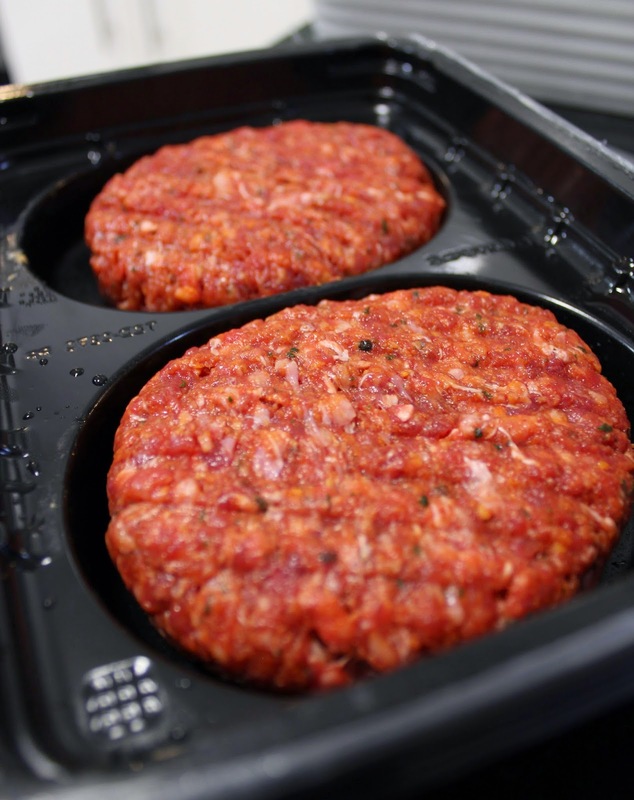 The first thing I did was opened up the packet of wagyu beef patties and chopped each patty into thirds. 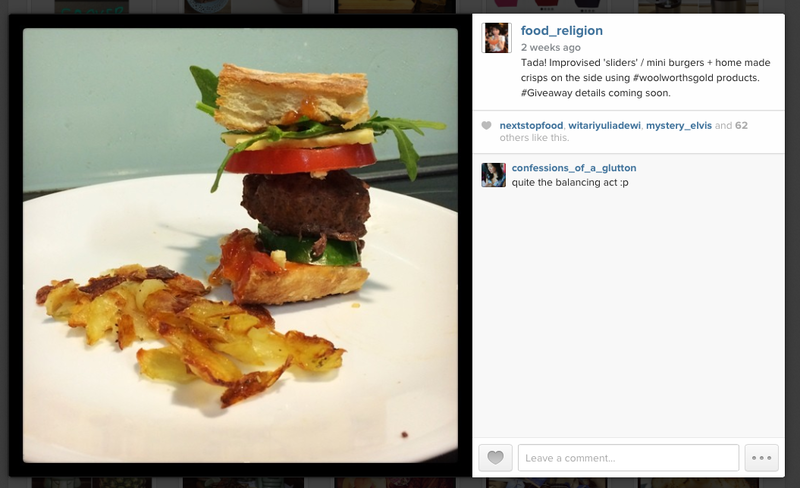 From there, I rolled them into a ball and then eventually turned one patty into three mini patties. After that, I poured some olive oil into a hot pan and cooked my precious little patties on each side for a couple minutes. Whilst that was cooking on the pan, I then cut up my load of turkish bread to match the size of my patties and popped them into the oven to crisp it up. With all that going on in the background, I then chopped up my veggies on the side. 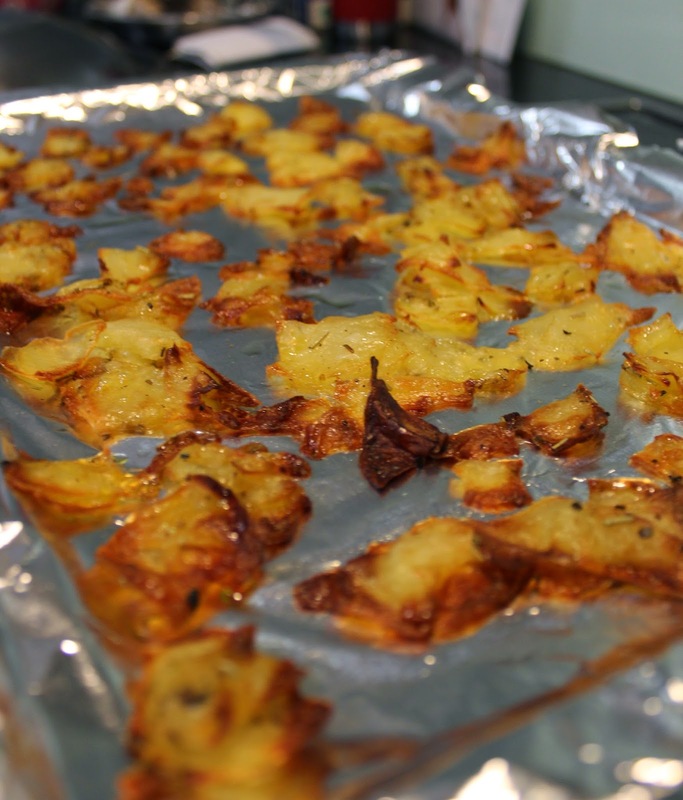 No one ever has a burger without some potato and since you already have the oven on, you might as well make the most of the electricity by making some potato crisps. no-one can ever have a burger without fries, even if it is a make shift version. To make the crisps it isn't rocket science. Yes as you probably know by now, I am a big fan of super easy recipes. With a slicer, slice your potatoes up, drizzle them in a generous amount of olive oil, sprinkle some salt and rosemary on top and pop them into the oven with your bread. My potato to burger ratio isn't exactly balanced on that picture mainly because I kept eating them while they were crisping up in the oven. heh. Everyone knows how to make a burger / sandwich but the key to making a good burger / sandwich is the way you stack it. You need to make sure your textures are separated out - don't have all your harder textures all lumped up together at the top or bottom. Spread them out. Also, I like to put my salt on tomatoes so the juices help soak up the salt so you can actually taste it rather than for example, adding it on a piece of cheese and not taste anything unless you give it like.. 10,000 sprinkles. Maybe then you can taste the salt lol. Anyways, once everything is stacked and salted correctly, wala! You finally have your mini burger / mini sandwich. Bon appétit! I was quite impressed with the quality of the patties. I actually thought I had overcooked them but surprisingly, the patties were still juicy and best of all, the beef was mixed in with loads of herbs which helped give it so much more flavour. Cannot wait to come back for more juicy beef goodness. The cherry tomato and chilli relish was a deal breaker for me. It made the burger / sandwich slightly sweeter but not overly sweet to the point where it dominated the taste of the patty. That relish is definitely a game changer. So with thanks to Woolworths and One Green Bean, I am giving away two of these hampers. In each of the hampers, you will get all the Woolworths gold products which I mentioned earlier in this post. PLUS each hamper comes with a $100 Woolworths gift voucher where you can either create your own Gold recipe or recreate mine. The first hamper to be given away will be selected from this post and the second winner will be selected in my next upcoming post. So watch this space for a second chance to win. Give this picture some love! To win one of these hampers, all you need to do is to like this picture on Instagram and drop a comment below to tell me what Gold dish you would create if you won one of these hampers. It is that easy. So here we are, at the end of another month and finally into the second half of the year. 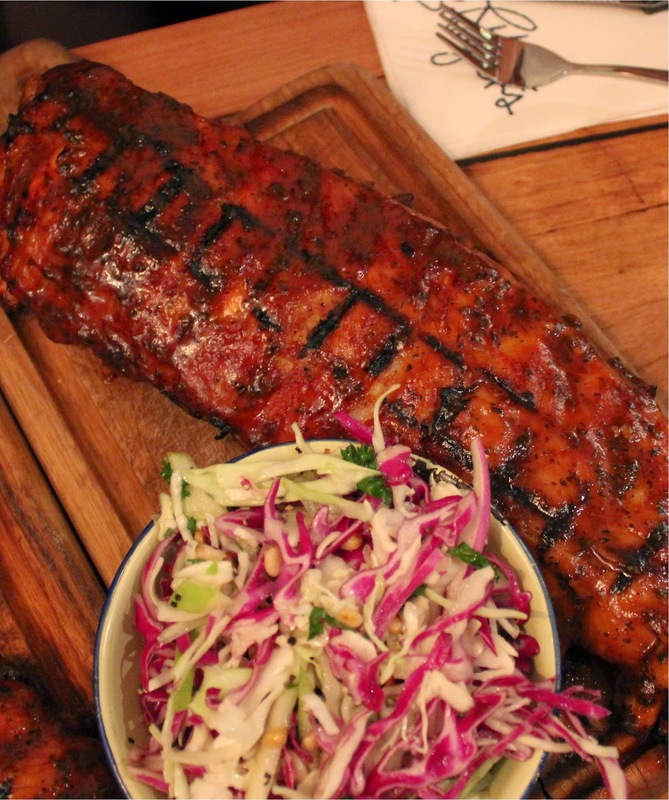 This month, it is going to be about ticking off another brunch spot in the inner west, ribs and burgers, getting our drinkies on anddddd a give-away.